After a long history of volume production and the crises that come with it – the bloodiest was in 1907 – the emphasis has shifted to quality since the 1970s. 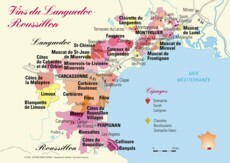 The Languedoc’s vineyards spread across the Gard, Hérault and Aude ‘departments’. From this area, Domus Maximus 2000 from Domaine Massamier La Mignarde was awarded the French Red Trophy for Syrah-Grenache-Mourvèdre blends in the International Wine Challenge 2005. The Roussillon vineyards, with over 24,000 ha in the Pyrénées-Orientales (East Pyrenees) department/region either side of Perpignan, show a degree of uniformity within a mountain framework in the Pyrenees foothills; the Corbières (to the north), Canigou (to the west), the Albères (to the south on the Spanish border). Mostly red wine: Côtes-du-Roussillon, Côtes-du-Roussillon-Villages to the north (with these villages named on the label: Caramany, Latour de France, Lesquerde and Tautavel), Collioure and its ‘Vins Doux Naturels’ (sweet fortified wines, white and red): Muscat-de-Rivesaltes, Maury, Rivesaltes, Banyuls.